The Legend of Grimrock Master Quest is a complete overhaul of the original game, with new puzzles, tougher monsters and plenty of changes and updates. So you finished Legend of Grimrock, opened all the treasure rooms, discovered the big secret and brought the house down with your sweaty dungeon spelunking prowess. Still want more? 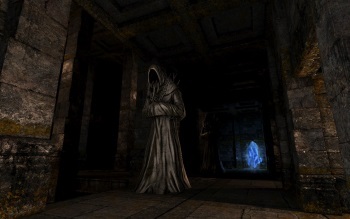 Then allow me to introduce you to the Legend of Grimrock Master Quest, a fan-made "complete reworking" of the game that maintains the overall dungeon layout but adds numerous changes to individual rooms and works in some completely new content as well. The Master Quest moves most major objects, "upgrades" puzzles - not sure what that means - and uses more and tougher monsters to make the game even tougher. It also now scales up significantly with higher-level players, so you can import your original party and continue to earn levels. Items have been given a "loot" value and your party will intermittently be assigned a ranking based on the total value of its inventory, while a final loot ranking near the end of the game gives players something more to shoot for than merely "survived or died." Other changes include a new, hidden boss fight, more impactful earthquakes, a new sidequest, a longer ending and nearly 50 new secrets. Legend of Grimrock is a fantastically old-school dungeon crawl and, luckily for grumpy oldsters like me, was successful enough that a sequel is on the way. It's still a long way off, but this looks like a pretty solid way to pass the time while we wait for it to show up. If you have the Steam version of the game, you can grab it simply by subscribing to the Legend of Grimrock Master Quest entry at the Steam Workshop, and if you're rocking the standalone release then you can pick it up from the Grimrock Nexus.